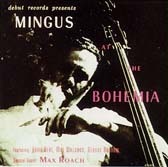 Bohemia sessions are available on two CDs, Charles Mingus Quintet Plus Max Roach and "Mingus At The Bohemia". On 'Percussion Discussion' (3), a second bass part was overdubbed onto the original track at some subsequent date. 'Septemberly' (5) is a Mingus arrangement, combining 'September In The Rain' and 'Tenderly'. 'All The Things You C#' (6) is a Mingus arrangement which combines Jerome Kern's 'All The Things You Are' with elements from the Rachmaninoff's 'Prelude In C# Minor' and Debussy's 'Claire de Lune'.